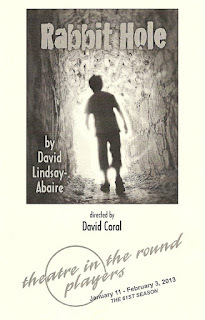 Theatre in the Round is celebrating their 500th mainstage production with the 2006 Pulitzer Prize-winning drama Rabbit Hole. It's a feat unmatched by any other theater in town, and this play is a great choice for this milestone event. Rabbit Hole is a really well-written contemporary play with just five (onstage) characters, who talk the way real people talk. The play depicts an unthinkable but unfortunately real situation - a family trying to cope with grief after the accidental death of a child. It's pretty intense, but fortunately there are some lighter humorous moments that break up the intensity, just like in life. From the cast to the direction to the set, Theatre in the Round does a fine job with this difficult work. The story begins eight months after the death of 4-year-old Danny. Grieving parents Becca (Elena Gianetti) and Howie (Ron Ravensborg) are dealing with the tragedy in different ways (she wants to move out of the house to avoid reminders, he repeatedly watches videos of their son), and are having a hard time meeting in the middle. Becca's sister Izzy (Rachel Finch, the standout in the cast with her completely natural acting) is her polar opposite and tries to distract everyone with her colorful life. Adding some much need comic relief is their mother Nat (Linda Sue Anderson, who's a hoot), with her crazy theories about "the Kennedy curse" and other rants. The delicate family balance is disturbed when the young man responsible for the accident appears (the appealing Kenny Martin II). This feels like a very real family dealing with a very real problem, struggling, sometimes failing, but continuing to be there for each other. The "in the round" stage looks like a real (but very neat, which is understandable given who lives there) contemporary home, complete with kitchen, dining room, living room, and a child's bedroom that looks as if he never left (set design by Peter W. Mitchell). I have a strange fascination with watching people perform real-life mundane tasks on stage, like folding laundry and washing dishes, and there's plenty of that here in this lifelike home. One of the things I love about Theatre in the Round is that you get to walk right through the set to get to your seats, which makes it seem even more real. 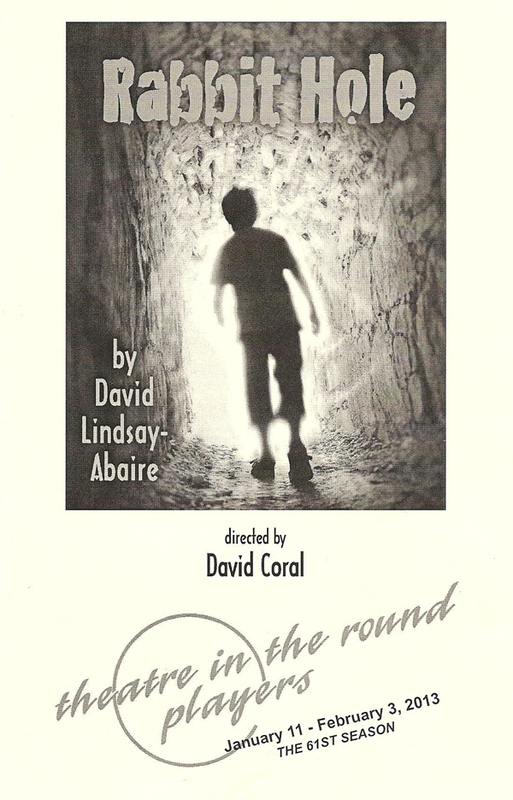 The nature of an "in the round" theater provides an interesting staging problem, but thanks to the direction by David Coral, I never felt like I was missing out on anything, even if a character's back was to me. During the effective scene transitions, the lights dim but don't go out, as evocative and appropriate music plays. We see the characters progress from one room/scene to another, in what are not throwaway moments but rather add to building the characters. Rabbit Hole is playing weekends now through February 3. If you haven't seen any of the previous 499 productions at Theatre in the Round, number 500 is a good place to start.